Last week, my husband and I drove with our youngest daughter to Louisiana for a college visit. It meant a lot of driving, but after years of taking our older daughter to out-of-state skating competitions, road trips are nothing new to us. While it’s nice to leave our daily routines behind and see new parts of the country (or revisit fun destinations), there are downsides to car travel. One of which is road food. I love burgers and fries more than is good for me, but eating in fast food joints, or even nice chain restaurants, palls after the first few days away from home. After a frustrating morning that included two wrong exits and a stretch of road without even a burger place, we decided to stop at Isabella, in Port Gibson, Mississippi. 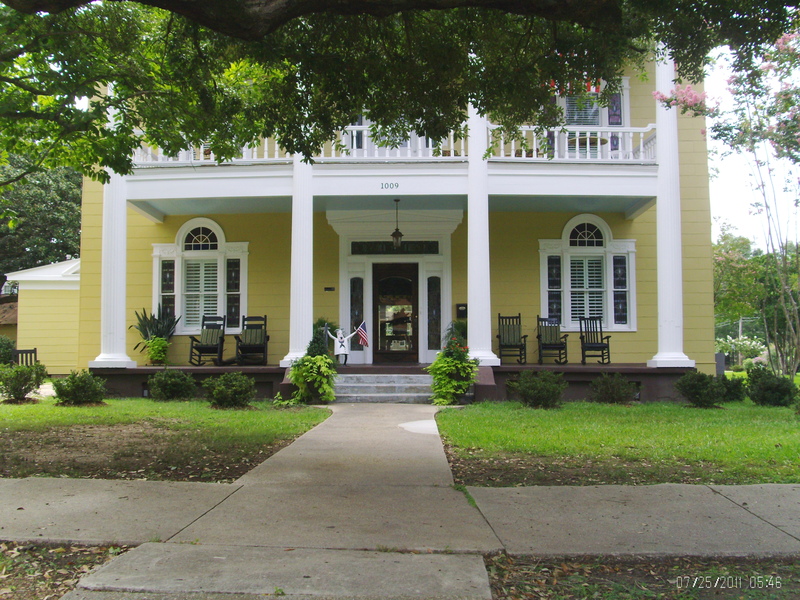 Located in a house dating from 1880, the bed and breakfast also serves lunches at its Porch Restaurant. Lucky us! Owners Bobbye and Phil Pinnix are only the third family to own the historic house, and their renovations include Victorian furnishings in the parlors and bedrooms. Even our lunch was served on a collection of vintage glassware and red toile plates. My husband enjoyed a huge roast beef sandwich with fresh fruit, while my daughter tucked into sliders and I tried a burger with a side of Bobbye’s potato salad. Yum! Did I mention they grow their own tomatoes? Fortunately for us, we arrived at the tail end of lunch, so we were able to chat with the Pinnixes. Bobbye told me that while she is not fanciful, she is convinced that the house is haunted by some of the former owners. She and Phil, along with some of their guests, have heard the sounds of glass shattering in the butler’s pantry and furniture dragged over the wooden floors. The ghostly activity seems to be limited to making noise, as there is never any broken glass or rearranged furniture to be found. Bobbye even told of receiving a comforting squeeze on the shoulder while she was completely alone in the kitchen area. According to her, spirits in the house don’t mean any harm. “After all, it was their house before it was ours,” she said. I am skeptical of most reports of paranormal activity myself, because I think much can be explained by scientific fact. However, I would love to risk a haunting if it means I can return to Isabella! How interesting.I think ghosts are around us,but some don’t show there appearance.I know my great great grandmother visited me at her old homeplace once,years ago. Really? Wow, what happened? I don’t discount all paranormal activity, because I’ve also observed some things that can’t be explained otherwise. I’d love to hear more about your great great grandmother’s visit! Next time take your good friend who is a paranormal investigator! I have equipment!!! Ooo, now that would be a fun road trip, wouldn’t it!